The biggest sporting discussion to happen this year won't be about Andy Murray winning Wimbledon. No, this year he gets a break, and the nation debates how many gold medals Britain will get in the sporting event of the decade! The Olympics need little introduction to most people, but for children they are an unknown quantity; how do you explain it, especially to a pre-schooler? Well, introduce them to the concept through this rather nifty new game from Orchard Toys. 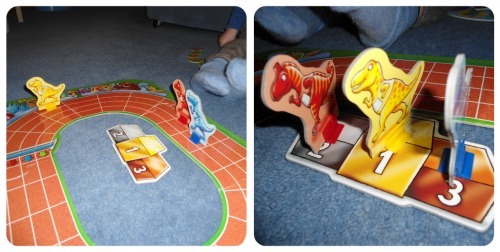 Dinosaur Race is an athletic style race-game involving between two and four dinosaurs to race around the track at the same time! That is the bit that bamboozled me at first, so I wanted to higlight it. 1. 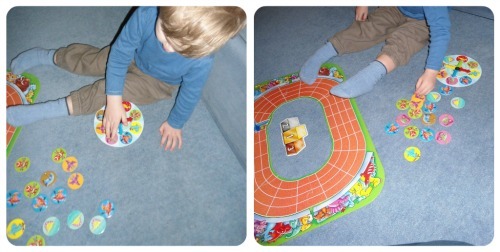 Assemble the race track with the jigsaw type pieces. 3. Line up your dinosaurs on the starting line. 4. The youngest member of the family spins first. The spinner has four coloured arrows on it, that work in conjunction with your playing piece. Each player notes the sport that their coloured arrow is pointing to, and takes that number of sports discs. There are a different amount of each sport shown on the discs. That may mean one player has three discs with a javelin on it, another has five swimming discs and a third has two weight-lifting discs. This is how you all move simultaneously around the board. 5. Each player moves the correct amount of spaces around the board, then returns the discs to the playing area but upside-down this time. This will create a new and different amount of sports discs for the next person's go. 6. Take it in turns to spin the spinner, counting out the right amount of discs each time, and moving the appropriate number of spaces. 7. Continue play until all players have crossed the board and assigned a 1st, 2nd or 3rd place. There are gold, silver and bronze medals to give to each player. If you're playing with four players, bad luck on this occasion. However, because there are four of each colour medal, you can continue to play cumulatively and see who ends up with the most medals of each type. 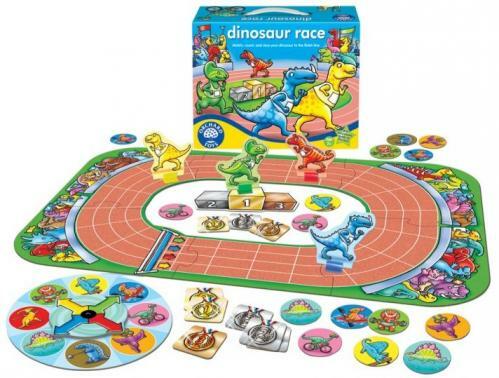 Dinosaur Race is another winner from Orchard Toys of whom I am a big, big fan. I'm not the only one in this household; all three of us enjoy playing them, and we tend to play at least one or two different games a day. For the vast majority of the games that we own that are aimed at aged three years and over, we play them with no problem, maybe a slightly watered down version, but we've enjoyed them since he was two. He's now two and two-thirds and I am not sure he would have been able to play this a few months ago due to the complexity of understanding everyone moving at the same time. He's very much all about 'your turn now daddy! ', so this variation of turn-taking threw him at first. Therefore I would advise this one is for the three-ten year olds as specified on the box. It's a very fun game, visual and attractive. It also opens up a world of sports to The Boy that he might otherwise have not been privy to. Developing his understanding of the world around him at this age is vital, and this game helps to develop them, along with the obvious pre-mathematical (matching and colour recognition) and mathematical development (counting the discs and playing spaces), language development (discussion) and social skills (turn-taking). I'd award Dinosaur Race a gold medal! Orchard Toys have been very generous and are going to give one of you lucky readers a copy of Dinosaur Race (worth £11.75). If you'd like to be in with a chance of winning, please fill in the Rafflecopter form below. Please note that all entry mechanisms must be completed, including using twitter! I was given a copy of this product for the purpose of the review. My opinion is honest and unbiased. I hate sport but love playing football with Charles. Or watching Banger Racing and Speedboats. I love watching Curling…very random, but could watch it for hours. And we like to support hubby when he's running – in fact the kids and I have challenged him to complete a half marathon this year and a marathon next! The only sport I partake in, is running (around after the kids!). I'm a huge sport fan and will watch almost anything so I love it when the Summer and Winter Olympics roll around every two years. Just wish we had tickets for the games in London! I like watching and playing tennis! I also love playing badmington and 'Swing Ball' with my little ones! I dont play any sport myself unless you include kicking a football around the field with my toddler lol – I do love watching the six Nations rugby though – Come On WALES!!!! My hubby loves football, and hoped our son would too. However, he prefers to watch Dancing on Ice with Mummy!!! Love watching the show jumping and cross country. i love watching and playing tennis! gymnastics, the 3 girls of the house love it!!! My favourite sporting event is the cycling – I love watching the skill of the riders in the velodrome & I also love watching the Tour de France; I became addicted to it when pregnant with Harry! I love show jumping…but dare I say find the olympics totally boring!! I'm not much of a sports person. For 'doing' I like to walk for miles in the hills so that isn't really a sport as such!! For watching, I like to watch snooker sometimes but thats it. Love watching rugby, and love doing zumba! I love to watch the diving! It has to be football!!! Rounders on the green with the neighbours in the summer is always brill fun! My favourite sporting event is spectating! LOL! My favourite sport is swimming. I love doing it and love watching international competitions. I like watching gymnastics. Really looking forward to the Olympics. Love watching gymnastics and the swimming and diving. Definately tennis – love it! I like watching the footie and like the snooker too!